Mercedes says the new CLS has a muscular sports-car look and flared wheel arches that resembles a feline predator waiting to pounce. Mercedes-Benz has unveiled pictures of its new CLS coupe-styled four-door sedan that will debut at the Paris auto show in September. The second-generation CLS has a completely new look compared with the current car and "points the way forward for the future perceptible design idiom of Mercedes-Benz," said Mercedes design head Gorden Wagener. "At the same time it takes its inspiration from the great tradition of stylish, refined sportiness which has always been a feature of Mercedes coupes," Wagoner said in a statement. Mercedes says the CLS is designed to have an athletic character with a muscular sports-car-like shoulder line above the rear axle and flared wheel arches that "resemble the powerful thighs of a feline predator waiting to pounce." Mercedes also says the car is the world's first to offer all of the regular dynamic light functions using LED technology with 71 LEDs that give a significantly enhanced view of the road compared with previous systems. The front is reminiscent of the Mercedes SLS AMG gullwing supercar. Visually, the radiator grille is not integrated into the hood but is formed separately. The grille is dominated by the large central star, which Mercedes says underlines the car's relationship to the brand's other coupes and also enhances brand identity. Inside is a wraparound cockpit with a sweeping instrument panel and an integrated central display. The top-shelf materials are highlighted by satin and high-gloss finishes and an analogue clock. The interior is complemented by wood and leather parts. Carbon-fiber and piano-black trim elements are also offered. Powertrain specifications for the new CLS were not announced. The CLS created a new segment for four-door coupe-styled sedans when it launched in October 2004. With 170,000 CLS cars sold worldwide since then, rivals Audi and BMW are scrambling to catch up. Audi will launch its CLS competitor, the A7, in Europe in November and in the United States in mid-2011. BMW will introduce its Grand Coupe four-door coupe in 2012 after unveiling a concept for the car at the Beijing auto show in April. The front of the CLS slopes off towards the rear - known as the dropping line by designers - harking back to historic Mercedes sports cars. 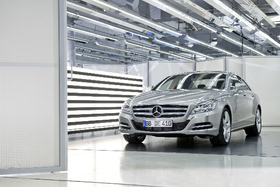 Mercedes sales and marketing chief Joachim Schmidt said the new CLS builds on the pioneering role of its predecessor. "Customers all over the world benefited from our bold move to launch a completely new vehicle concept onto the market," he said in a statement. "And with its exciting design, the new edition of the CLS also benefits from the fact that we are a whole generation ahead of the competition with our four-door coupe." 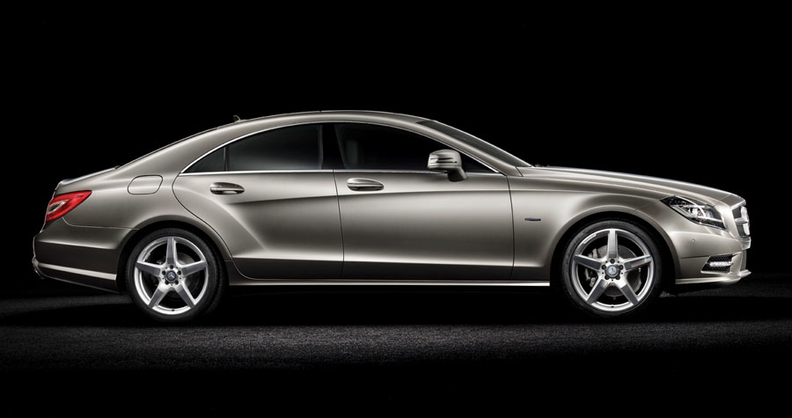 The new CLS will go on sale in Europe starting in November. U.S. sales begin in mid-2011.